On the 14th day of March 2018, BIRUDO helped Kiiza Alice Balamu Aheebwa to regain her land that had been grabbed from her by the Bahukwa Clan. 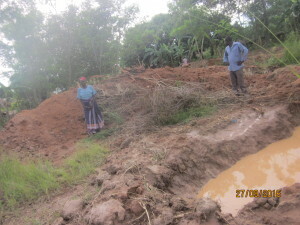 Alice had owned the land in question for over 20 years in Kijangi Village in Buliisa Sub-County. BIRUDO successfully mediated this case with the help of elders and clan members. Finally, the Bahukwa Clan agreed to handover the land to Alice. Thereafter, both parties signed a Consent Agreement and the duo parties peacefully demarcated the land boundary. With support from Natural Resource Governance Institute (NRGI), BIRUDO has this July/August 2017 has been focusing exclusively on strengthening capacity of women participation in oil and gas development through informing women of their land rights, and on documenting how women have been affected by land transactions related to the construction of oil infrastructure. The program is focused on the five villages closest to the area in which the Central Processing Facility (CPF) is planned, namely Kisomere, Kasenyi, Uduuk II, Kibambura, and Kirama. BIRUDO will then take forward the women’s concerns and complaints to both sub-county representatives, and the district administration. 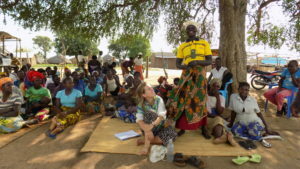 Local community in Kakoora Village in Buliisa Sub county in Buliisa District attending a awareness meeting organised by BIRUDO with support from USAID and UKaid GAPP Program. The meeting was organised with the purpose to ensure that local community benefit from local government livelihood programs and promote good governance and accountability. 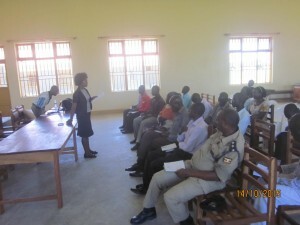 Sub County community development officer Ms. Mulinzi Joseline was used to sensitize the local community. During the awareness Ms. Mulinzi presented how local community can benefit from youth livelihood program, PRDP, women empowerment program, operation wealth creation, UWA revenue sharing, social action grant for older person and NUSAF III. However, the local community of Kakoora Village complained that in most cases they are left out and their local council I chairperson is alway not involve in these programs. Ms. Mulinzi promised to help community members in forming groups and filling forms so that they benefit from these program. Today BIRUDO has started raising awareness on public finance management Act 2015 mostly on royalties sharing and ways to manage local communities and their leader’s expectations in the next phase of the oil and gas production at village levels. This activity is supported by Natural Resource Governance Institute (NRGI). 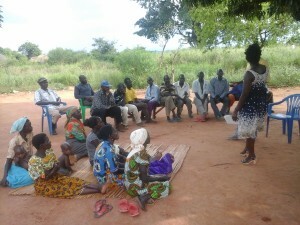 Local communities in Muvlue Village in Ngwedo Sub County Buliisa District attending the awareness meeting. 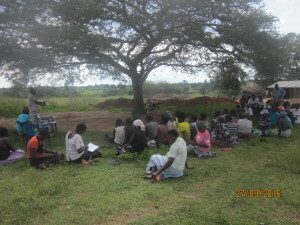 During the meeting a women raised a complaint on how road construction is destroying their crops without compensation. 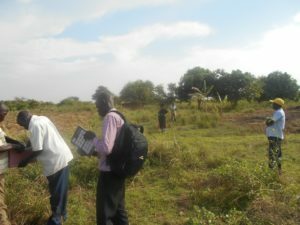 She said, she always earned income out of these destroyed crops from tourists who pass by to Murchison Falls National Park. BIRUDO staff after the meeting visited her field. On 27th January, 2016 Mr. Bonefence Bikobo report a case to BIRUDO office for mediation on land and compensation which Tullow Oil Company is to pay him on access road. But the son Mr. Robert Wathaum claim that the land where access road is belong to him, it was given to him by his grand father. on 20th Feburary, 2016 Mr. Robert Wathaum was poison and death on the same day. He left two widows and three children who are trying to followup the case. BIRUDO try the engage Mr. Bonefence Bikobo to resolve the case on one to one but failed. On 15th April, 2016 BIRUDO organised a mediation meeting in their Village which was attended by Tullow Oil Company SP-Coordinator Ms. Keren Atugonza and Inspector of Police incharge of CFPU Buliisa District Ms. Kalsium M. Bioga and the Village community. The Widows made a demand to share both land and compensation money but Mr. Bonefence Bikobo refused to the demand said he will not accept dividing both land and compensation money. Therefore these widows and children help to protect their rights over this land and the compensation money. The key stakeholders in Buliisa District and USAID SAFE Team attending project review meeting at Buliisa District Resource Centre. This meeting was to share end of project evaluation report with key stakeholders and get feedback and inputs from key stakeholders from a one (1) year project from 1st November, 2014 to 31st October, 2015. The project aim at contributing towards strengthening the capacity of the formal and informal land management and administration institutions in two (2) sub counties of Ngwedo and Kigwera, Buliisa District. This project was funded by USAID SAFE Program with fund from American People. 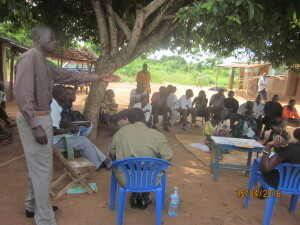 The project focus on legal and land rights awareness, Capacity building of Local Councils Courts, Area land committees, District Land Board and cultural leaders, capacity building of Community Legal Volunteers (CLVs) on legal aspects of land and land rights as well Alternative Dispute Resolution. So as CLVs monitor land rights violations, conduct mediation, refer the clients, and act as focal point persons for BIRUDO and BIRUDO’s in house lawyer provide on spot legal advice and counseling. Mediation where necessary. Buliisa Initiative for Rural Development Organization (BIRUDO) is implement a project aim to ‘Stimulate a Public Debate on How Local Governments Can Best Utilize Extractive Royalties in Buliisa District,’ with funding from Natural Resource Governance Institute (“NRGI”). 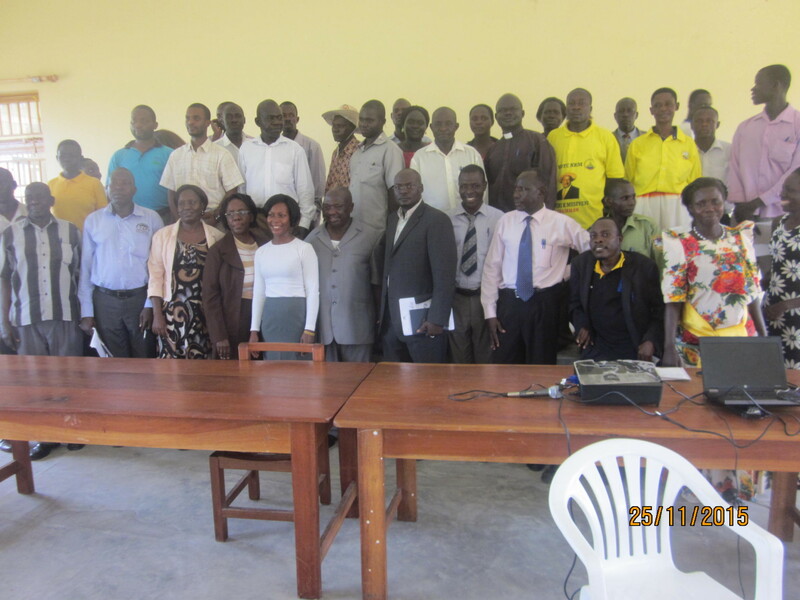 On 14th October, 2015 BIRUDO held dialogue at Buliisa District targeted District leaderships comprise of district local council, standing committees, technical staff, security officials and CSOs representatives. The project aim at empowering the local communities and their leaders with knowledge and innovation that enable them promote best practices of transparent and accountability of managing royalties to the local government and information sharing. 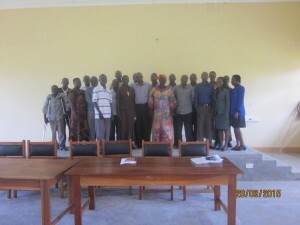 On 28th September, 2015 BIRUDO launch a project aim to guarantee proper implementation of government programs and accountability, BIRUDO, under the auspices of Governance, Accountability, Participation and Performance (GAPP) Project with funding from USAID and UKaid GAPP Program, is empowering Vulnerable Groups, Community Based Organizations and Local Communities with innovations for meaningful engagement with local governments to ensure proper implementation of government programs and accountability in Buliisa District.